As women, we have unique nutritional needs. IdealLean Protein meets those needs head on. And because we know that women play hard and never quit, we created IdealLean Protein. Get ready to get lean! This is the first protein that I don't have to "choke down." The consistency is smooth, not chalky, and it blends well with just about any of your favorite liquids (my favorite is almond milk). You can't go wrong with any of the flavors, however, chocolate mint is an absolute must if you're trying to keep away from those tempting GS thin mint cookies! The only thing that I'd have to say needs an improvement is the overall sweetness. I say tone it back just a smidge on the sweetness. Other than that, I am a happy idealfit consumer and so glad to have found an affordable, quality product to stand behind 100%! This is how I started! Bought these to get variety. Ended up with every flavor. They are all so delicious and with no fat or carbs, you cannot go wrong! 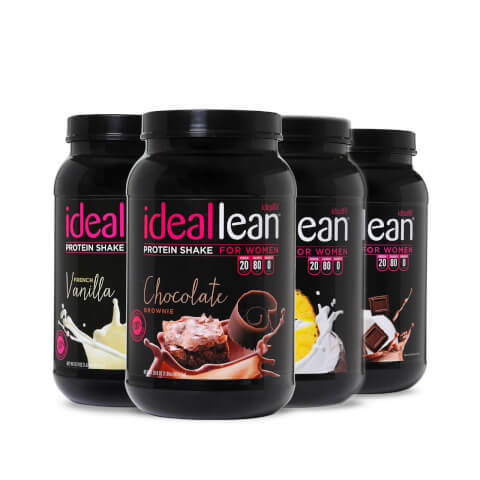 Ideal is the best protein ever. I love that there are no carbs or sugars. Also the fact that there are not a bunch of junkie unneeded ingredients. The taste is amazing. I love that I can mix in so many different things. It's like having a different smoothie everyday. I love the chocolate mixed with frozen raspberries it's like a good for you dessert. Yummy !!!! Being able to get a bundle with different flavors is just another plus. Mixing it up never boring alway delish. I love this protein (all flavors). It mixes better than any protein I've ever tried and taste great with water! The macros are great!!! These products are amazing! I just completed Lindsey's 15 Day Challenge using this protein and I lost 7.5lbs and 11inches! The protein tastes fantastic without the chalkiness and aftertaste of other brands. The best part is I never feel like I'm starving throughout the day because this product actually makes me feel full. My personal favorite is the Brownie Batter Protein with a TBSP of peanut butter and half a frozen banana. I love Ideallean! Trainer Lindsay and Ideallean protien got me off of my plateau and into a healthy and amazing body. Taste is awesome and very affordable too! I can't believe how good this protein is! The chocolate ones are really sweet but in a real, chocolaty sweet way not sticky sweet. The piña colada blew my mind! My husband tried it and the first thing he said was "omg that needs some rum, some ice and a pool... can you overdose on protein?" I love that it's fruity instead of rich i find it easier to drink in the morning, I can't wait to try the peaches and cream!!! I've tried just about every protein there is, and nothing beats IdealLean. As a retired college athlete, I need something that will keep my lean muscle and tastes great, and IdealLean does it all. I have been buying their products for over a year now, and have increased my servings to three a day. BEST protein on the market for women to keep you slim and strong!